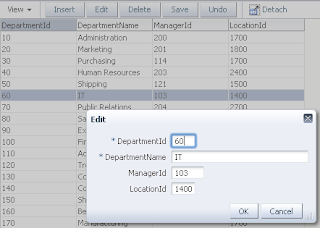 If you are thinking how to delete nodes from ADF tree, there is Frank Nimphius blog post - ADF Faces RC: Single row / Multi row delete from a tree component. 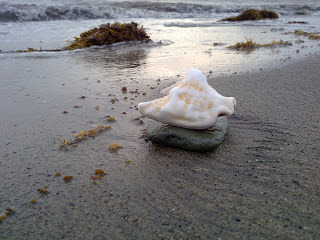 However, Frank says that his blog entry is still a raw diamond and needs some polishing. 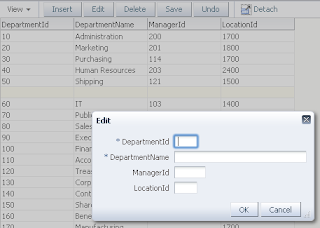 In his example, if you remove root node, all child nodes still will remain in database. This means tree hierarchy will be broken. I decided to polish raw diamond, to describe how you can traverse ADF tree and remove all selected nodes together with children. 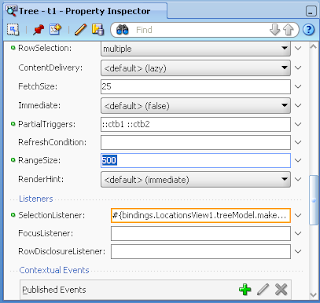 Download sample application - TreeTraversal.zip. This sample implements ADF tree traversal algorithm without recursion. 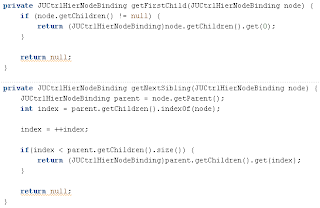 ADF tree component provides Java API to get parent node for current node, this allows to avoid recursion. Tree traversal algorithm scans selected nodes, and walks through all child nodes. When it reaches last child in tree branch, it returns back until it finds next child sibling. At the end it will return to the initial node, where tree traversal was started - root node. It starts from first selection and walks from 100 to 102, reports parent node 90 and goes to second selection, walks through and reports parent node 110. It will keep 500 nodes in memory, and will allow such tree operations as Expand All Nodes and Expand All Nodes Below to perform faster. 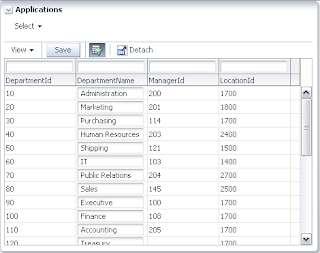 In my last post I described Dynamic Dashboard component, it allows to integrate separate applications using ADF regions. If we have fragments, we can drag and drop them easily into dashboard component as regions. 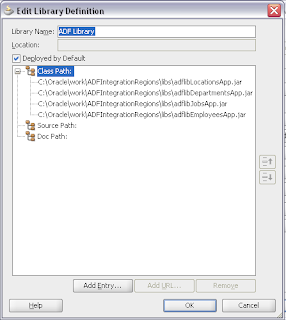 You can read more about how to integrate ADF applications from my integration post series. 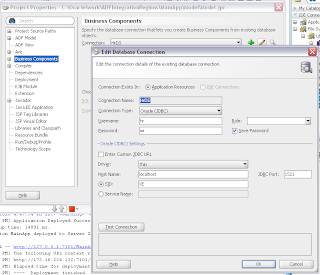 Depending on requirements, you may want to implement dynamic regions and integrate your ADF applications into single main application. Well, I was thinking about this before, but it was not working. Until one fellow developer from sunny South Africa didn't logged it (thanks to him) on Oracle Metalink (SR 3-1354209241), and got reply. 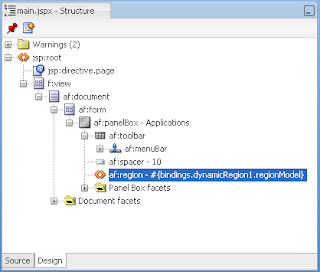 Well, I will describe today how you can use Dynamic Regions for ADF applications integration. 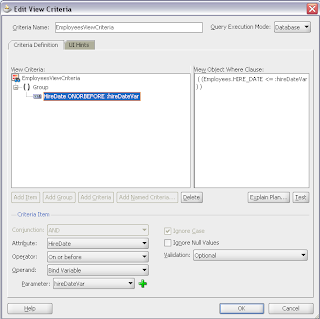 Download sample application - ADFIntegrationRegions.zip. 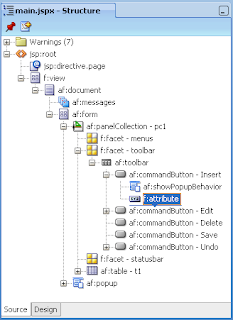 This sample implements four different separate applications, all of them contain JSF Fragments and ADF Task Flows. 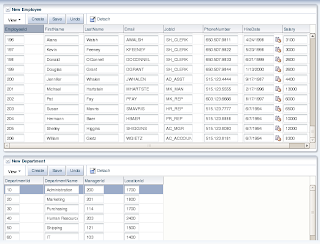 Also there is one main application, where all four are integrated through ADF Regions included from ADF Libraries. 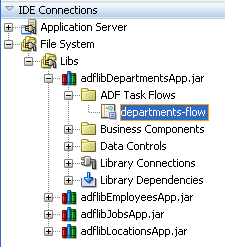 My today post is next in ADF integration series - Integration. 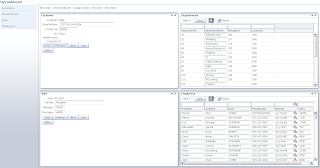 Sample application, I'm going to describe, is based on Dynamic Dashboard Demo code from Oracle ADF Faces Components demo (see Visual Designs). In one of my projects, I got a design requirement to develop entire application with regions, practically using only one JSPX page. 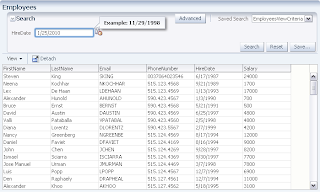 Different regions were implemented in separate applications and integrated into main application using ADF JAR libraries. Logically thinking, I should not develop any Dynamic Dashboard UI Shell, and just use ADF Dynamic Regions functionality. Unfortunately, in current JDev 11g PS1 release, we have problems with Dynamic Regions rendering and usage - see SR 3-1354209241 Oracle Metalink request logged by fellow developer. I decided to implement UI Shell that renders static ADF Regions, but in dynamic way. You can see that Model project in DynamicDashboard is empty, thats correct - because I'm using it only to integrate content from another applications. 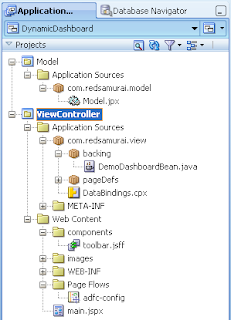 ViewController contains one JSPX page, where Dynamic Dashboard is implemented, and Toolbar declarative component with toolbar elements. 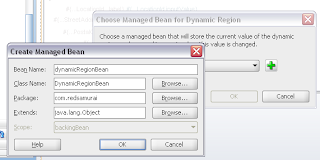 You will find DemoDashboardBean there as well, its where all drag and drop logic is implemented. 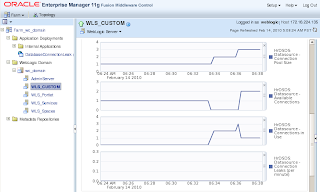 Same bean controls minimize, maximize and restore operations applied for Dynamic Dashboard elements. 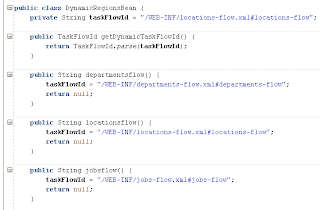 I'm not going to describe all technical specifics for Dynamic Dashboard, its code is quite straightforward. I took Oracle example from Oracle ADF Faces Components demo and removed things I didn't wanted to have, now it is more lightweight and optimized for ADF Regions integration. I rather will focus on functionality. Here you can see main Dynamic Dashboard screen - four integrated ADF Regions, placeholder to keep minimized regions on the left and New Job, Job Distribution, Assigned Jobs, Show All and Shown None links on the top. 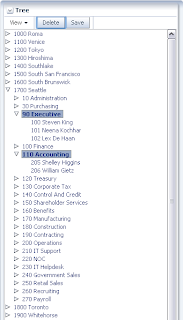 These links allow to show predefined sets of regions. Depending on a use case, Dynamic Dashboard potentially can replace UI design with different tabs. If you was reading my previous post - Monitoring Data Source Connection Leaks, you got clear idea how you can monitor data source connection pool usage by Oracle ADF application. 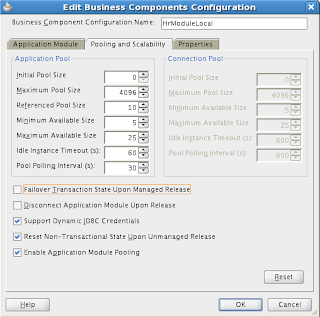 Basically speaking, Oracle ADF application works with two pools - Application and Database. First pool allows to optimize application work on middle tier, while second pool cares about database connections. 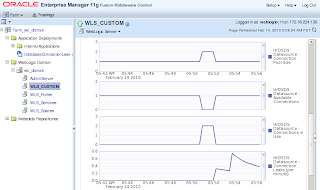 Today I will describe how you can control JNDI data source connection pool. As a reference, please check Steve Muench article - Understanding Application Module Pooling Concepts and Configuration Parameters. This post will be based mostly on Application Pool Cleanup Parameters section. Download sample application with optimized data source connection pool usage - DatabaseConnectionLeak.zip. Main topic I will talk today is how to control data source connection pool grow. Most of ADF 11g applications are developed using JSF Fragments. 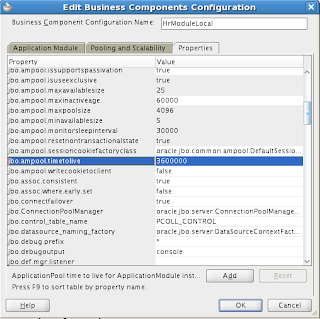 Usually separate JSF Fragments are based on separate Application Modules. 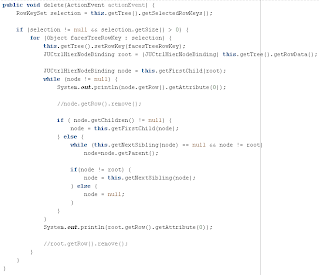 This means, if main page contains 10 JSF Fragments, 10 Application Modules will be involved during main page rendering. If there will be 10 users, there will be 10 x 10 = 100 connections created in data source connection pool. I don't want to say its not good to have many Application Modules, its good - work load will be distributed across different Application Modules. What is not good - by default, data source connections are removed back to available pool after really long time. Systems were we have many concurrent users can run out of available data source connections. Connection Pool Size increases up to 2 connections - thats correct, because main page involves two Application Modules. Connections in Use pool contains two active connections. 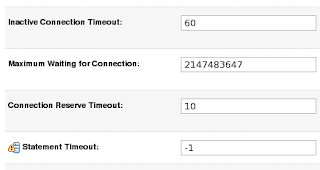 As mentioned above, Inactive Connection Timeout was set to 60 seconds, and after 60 seconds we can see both reserved connections were removed from Connections in Use pool. Thats correct, but same time Connection Leaks were reported. This means, we can't use WebLogic Inactive Connection Timeout option to manage data source connections. ADF application keeps data source connection and WebLogic is removing it by force - its why leaked connections are reported. You can set Inactive Connection Timeout to be triggered once per day, to ensure any really leaked connections are removed. Such behavior is not acceptable and will expand data source connection pool very fast, this will block your application. Default value is 1 hour, while it is acceptable, in most of the systems it will be too long. 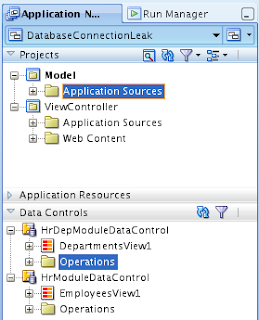 While Application Module instance will be alive, it will keep opened database connection in use. 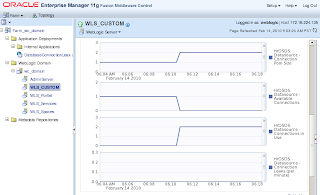 Yes, new users will reuse Application Instances available in Application Module pool and this will prevent database connection grow. However, where we have many concurrent users and many Application Modules involved, 1 hour for Maximum Instance to Live can be too long. 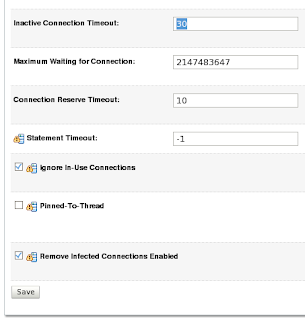 While Idle Instance Timeout and Pool Pooling Interval will help you to optimize Application Pool, Maximum Instance Time to Live property will help to optimize entire application workload. When it comes to production, often you can face problems with growing number of Data Source connections. 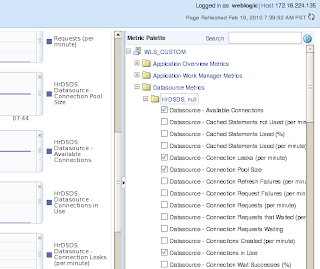 I see this as frequent problem - WebLogic admins complain that ADF application is using 1000 Data Source connections, on other hand ADF developers postpone code quality to be checked after deadline :-) And then they start to blame ADF, no need for this, just monitor your system and double check your code. Today I will demonstrate how you can monitor Data Source usage with Oracle Enterprise Manager 11g. 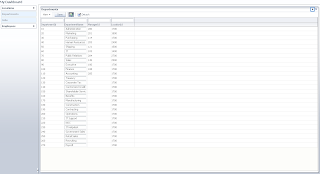 I will show Data Source connection leaking case, in my next post I will tell you the reason, why you can have leaked Data Source connections in ADF (it will be development bad practice example). In my case, I set it to 30 seconds, it is because I'm monitoring application for testing purpose. You should set it to longer period, may be 600 seconds. 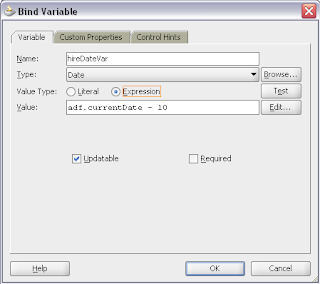 Download sample application - TableDialogEdit3.zip. At first, we thought may be WebCenter Suite 11g runtime is not working on 64 bit platforms. 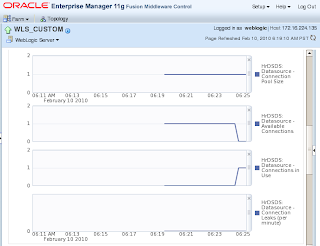 So, we uninstalled all servers and did fresh install using only ADF 11g runtime libraries. We deployed simple ADF 11g application and got same exception. It became obvious, that its not WebCenter Suite 11g problem. After some brainstorming, and couple of tea/coffee breaks, we understood that 64 bit JDK from Oracle (Sun) we were using is newer comparing to that 32 bit JDK packaged together with Oracle WebLogic Server installation. We were using latest jdk160_18, while Oracle WebLogic is packaged with 32 bit jdk160_14 version. So, we downloaded 64 bit jdk160_14 and reinstalled cluster again. 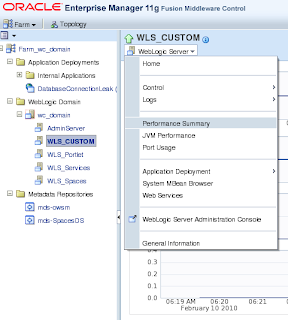 This time ADF/WebCenter 11g deployment was working without any problems on 64 bit cluster environment. 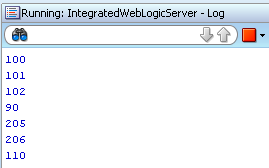 Lesson learned: When installing Oracle WebLogic on 64 bit platform, you need to download Oracle WebLogic installation that comes without Java. Make sure you will use same 64 bit Java version, as it is used in packaged Oracle WebLogic installs with 32 bit Java.